Today, it seems that news we hear about the environment is always concerning the local/ national climate. So here in Canada, the news is primarily about the arctic and its rapid deterioration, or what Canada does about it in the international stage (Kyoto Protocol, etc). This results in an apathy and disinterest for foreign environmental topics. For example, a farmer in the middle of Kansas would not have much concern for the the melting polar ice caps compared to a Canadian or northern European. Unfortunately just like the economy, what ever happens in the other side of the world, will eventually affect the other. Going back to the example of the farmer in Kansas, he right now along with much of north america is suffering from the effects of a severe drought which is theorized by some scientists as being prolonged by the melting of the arctic ice caps. 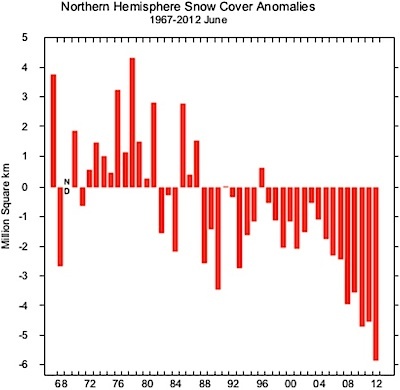 The study theorizes that as a result of fewer and fewer snow cover in the arctic during the summer months results in more heat being retained, which in turn results in a dramatically altered jet stream which leads to midsummer weather patterns in the middle latitudes to continue longer than expected. As a result weather in the fall is much warmer and drier than usual. The hypothesis is still to be fully proven by scientists for they they are still debating whether the warming in the arctic is caused by humans or is natural, but based on the evidence so far both the drought and the warming of the arctic have shown some link between each other. The apathy for non-local(national) environmental problems is something that should be eliminated, for long distance problems have a way of finding a way to affect those far from it. Paragraph 3 has a run-on sentence. It’s unclear what you are trying to HTML link to in the word “far” without visiting the link first. In response to your questions – it is not too formal. You may want to split your last paragraph up into two, since the conclusion should be separate from the example. Adding in a second example would help establish your point more concretely. How can we help alleviate this apathy? Personal opinion or professorial both work here. in the first paragraph you contradict yourself a bit when talking about Kyoto. Are there any other reasons that citizens are disinterested?